You're probably thinking that you wouldn't eat flowers! It's weird! You wouldn't let your dog or cat eat them, so why would you?! Well, you've probably already eaten some type of flower and didn't even realize it. Broccoli, cauliflower, broccoflower and artichokes are flowers. Paella and some risotto dishes use saffron to get that lovely golden color. Saffron is the stigma of the crocus flower. Capers are the unopened flower bud of a bush native to the Mediterranean and parts of Asia. Carnation petals are one of the secret ingredients that has been used to make the French liqueur, Chartreuse, since the 17th century. Have any of you ever eaten the square, violet flavored candies? 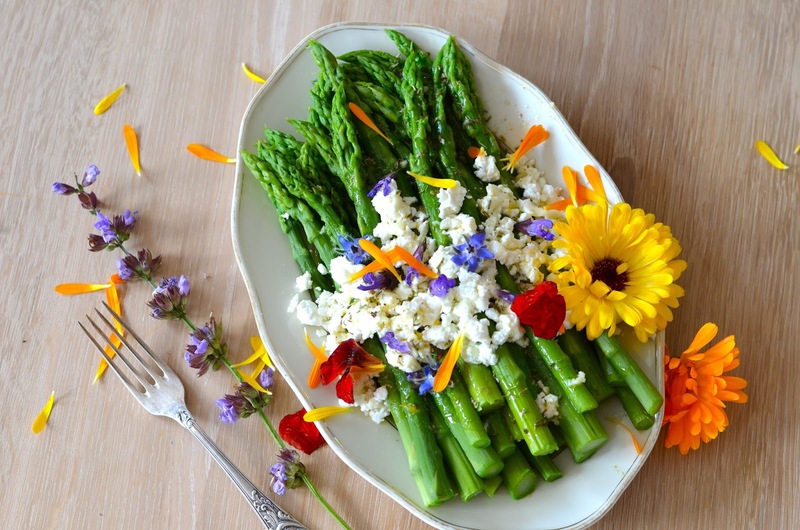 Flowers have been used to flavor and garnish dishes since ancient times. Many have antiseptic and medicinal uses as well. Upscale restaurant chefs commonly use edible petals as a final touch to many salads and soups. Pastry chefs, especially those who make special occasion cakes, use crystalized, candied and fresh flowers to add a touch of nostalgia to their creations. Floral waters are extensively used in the cuisines of India, the Middle East and Eastern Europe to flavor meat stews to pastries to coffees and teas. In Turkey, rose water is used to flavor candies, such as Turkish Delight and the nut & phyllo pastry, Baklava. Before the birth of Christ, Persia was exporting rose water as far as China. In India, the festive creamed rice dish known as kheer is flavored with cardomom and rose water and decorated with silver leaf. Orange flower water is often mixed with sugar and given to children before bedtime in some Middle Eastern countries. It is also used in the cocktail, Ramos Gin Fizz. Orgeat syrup is made with almonds, sugar and either rose or orange flower water. It has a very strong almond taste and is used to flavor Italian ices and cocktails such as Mai Tai and Scorpion. A North African spice mixture called ras-el-hanout uses lavendar and rosebuds along with spices such as peppercorns, cardamom, mace, galangal, nutmeg, allspice, cinnamon, ash berries, cloves, ginger, tumeric, nigella, orrisroot, cassia and fennel seeds. In Italy and France, zucchini flowers are often stuffed (commonly with cheese) and then battered and fried. The blossoms are chopped, sauteed and served in warm tortillas in Mexico. 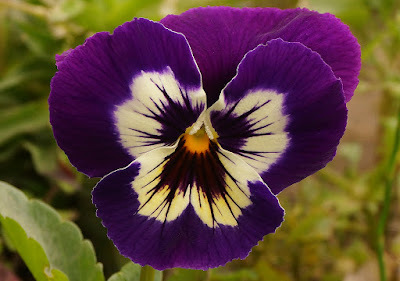 Use only edible flowers, such as the one described below. Make sure the flowers have been grown without the help of pesticides or chemical sprays. Flowers from most florists are treated, so choose those grown specifically to be eaten or from an untreated home garden. Any flower that comes into contact with food (such as for a garnish) should be suitable for human consumptions. All of the flowers mentioned in this article are non-toxic and safe for culinary purposes. Flowers should be picked early in the day and in dry weather. Rinse them quickly under gently running, cool water. Blossoms wilt quickly, so only pick what you will use in one day. Before using, remove the pistils, stamens (the middle parts) and the white part at the base of the petal. This white part is called the "heel" and will impart a bitter taste. If using in a salad with dressing, add the flowers last. Do not toss with the salad, as the acid in the dressing will spoil the color and fresh appearance of the delicate petals. It is best to toss the greens with the dressing, put a portion on each serving plate and then sprinkle the petals on. 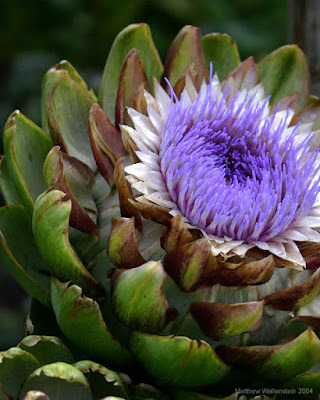 Artichoke: dip the meaty flesh of the base of the "leaves" in melted butter or a creamy dressing. The unblossomed flower is actually the choke, which is not eaten. Scrape this out and eat the tender base (bottoms). Arugula: also known as rocket, the flowers as well as the peppery leaves are edible. Banana: the whole purple blossom and the bracts which hold the flowers are edible. Slice, parboil and drain before adding to curries or stir fries. Basil: there are 150 varieties of this plant with names like cinnamon, lemon and licorice, depending on the aroma, and the color can range from green to purple. The flowers as well as the leaves are edible. 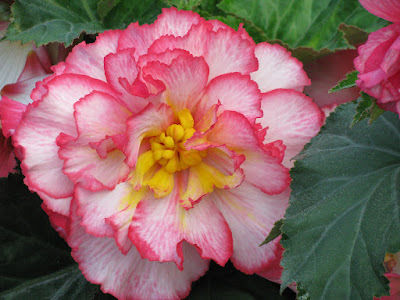 Begonia: the stems of this flower can be substituted for rhubarb. Borage: the star-shaped pink, sky blue and violet flowers have a cucumber-like flavor. Celtic warriors drank borage wine to increase courage. Modern research has found that borage stimulated adrenaline production. It is also used by herbalists as a diuretic, to relieve fever and bronchitis. Calendula: is also called pot marigold. Tinctures are used to treat headaches and toothaches. Ancient Romans used calendula to treat scorpion bites and Civil War soldiers found it helped stop wounds from bleeding. Commonly used to add a golden color to soups, grains or scrambled eggs. Carnation: steep in wine, make candy or use as a cake decoration. Remove petals from calyx and snip off the bitter white base before using. Chives: both the stem and the flowers are edible. Chrysanthemum: the colors vary from bright yellow to deep rust and the flavor can be mild or bitter. Taste before using. Briefly blanch before adding to Chinese-style stir fries or tossing with salad greens. 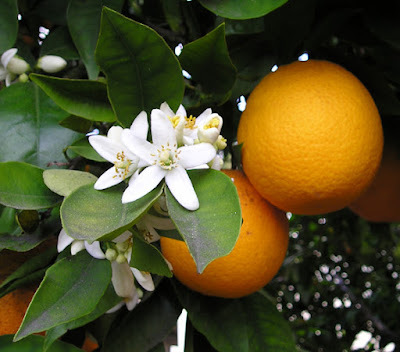 Citrus: all forms of citrus have been cultivated in the Mediterranean and North Africa. The petals tend to be waxy and have a pronounced flavor, so use sparingly. Orange flower water is sold in baking supply and Middle Eastern stores, usually in a blue bottle. Cornflower: also called bachelor's button, this azure colored flower is a natural food dye. It is used as a garnish and the Germans use it in a popular liqueur. Dandelion: is a hardy weed which is used either raw or cooked. As a child, I often saw older, Italian-American women in the grassy areas along the Bronx River Parkway in NYC picking these flowers to use for dandelion wine. The roots are also used as a coffee substitute. Daylily: these flowers live for only 24 hours. Other varieties are edible, but some are poisonous, so check with a reference source before using. It has a crunchy texture and the dried Tiger Lily buds are added to soups and stir fries in China. Chop or slice and sprinkle sparingly on salads, soups and omelets. 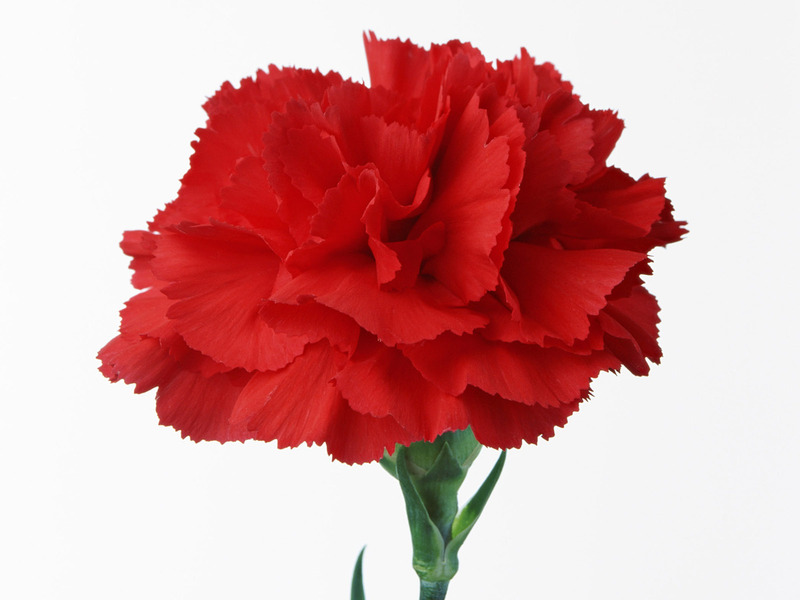 Dianthus: a member of the carnation family, it is a colorful addition to salads, aspics or herb butters. It has a nutmeg-like scent. Dill: the tiny yellow blooms are a good seasoning for soups or dips. Freesia: lightly scented, it makes a good flavoring for sorbet if infused in a sugar syrup. 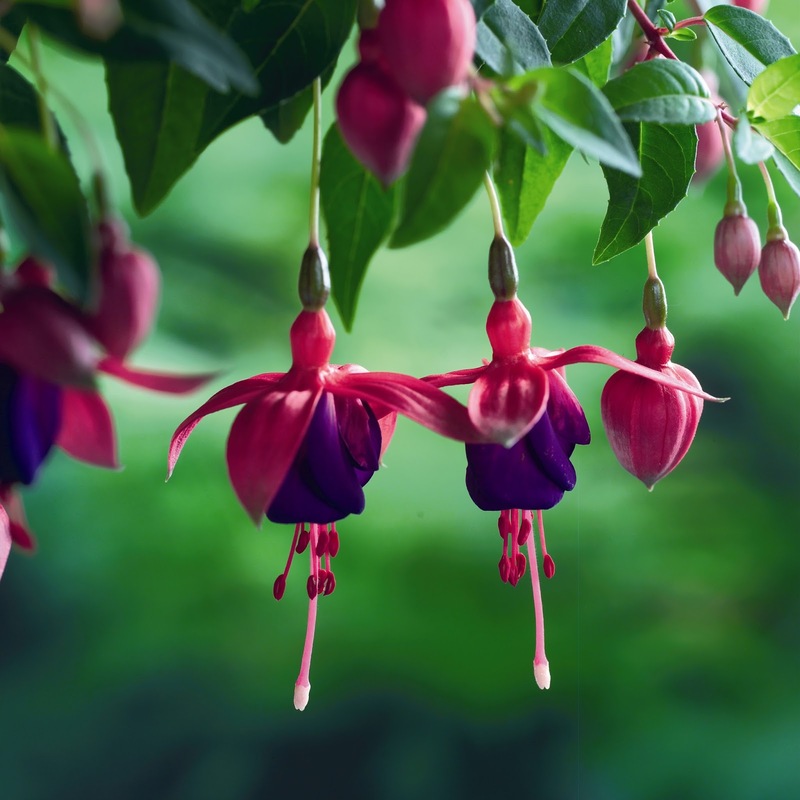 Fuchsia: the flowers have no distinct flavor but the color and shape are ideal for garnish. Gardenia: the light, cream colored blossom is good for garnish. In the Far East, dried blossoms are used in jasmine tea which is served in many Chinese restaurants in the US. Geraniums: the leaves have the fragrance of pineapple, lemon or rose, depending on the variety. An aromatic distilled water is made in Tunisia: to use in pastries and drinks. Gladiola: can be used to top cakes or for garnish. Hibiscus: the state flower of Hawaii is also common in the Mediterranean, Mexico, the Caribbean, Africa and parts of Asia. The fleshy dried calyx is boiled to make a garnet colored beverage which is sweetened and served on ice in Mexico and the Caribbean. The slightly acidic petals can be sparingly added to salads or lightly cooked. Can also be used as a "container" for diced fruit (like a cornucopia with the fruit spilling onto the plate). 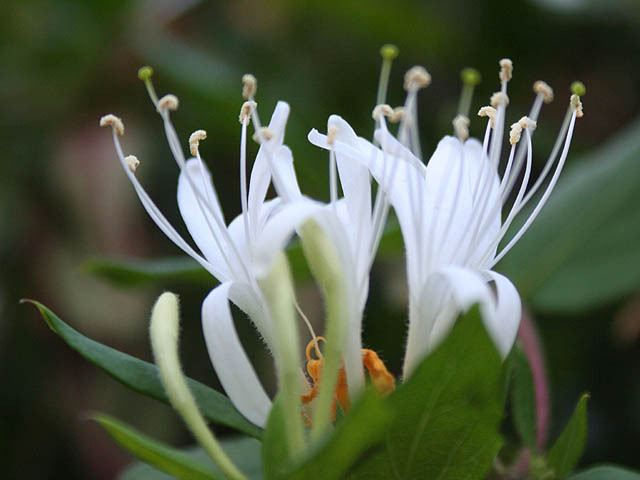 Honeysuckle: the white or pale yellow flowers have a syrupy-sweet nectar. The flowers can be candied whole or used in sorbets, soft drinks or for cake decorations. Lavendar: is used medicinally as an expectorant and antispasmodic. Violet: candies are sold in the US. The dried flowers are used to prepare fragrant waters, vinegars, custards, sorbets, cookies and the candied flowers are used to decorate cakes. Lemon Verbena: it has a sweet, lemony scent and is used for teas to relax and ease digestion. Sweet Marigold: also called Spanish, Mexican or winter tarragon. The leaves and yellow flowers have a taste similar to French tarragon. Use sparingly in herb vinegars, dressings or dishes which call for tarragon. Mint: there are over 600 varieties, but not all are edible. Spearmint and peppermint are the two most popular varieties. 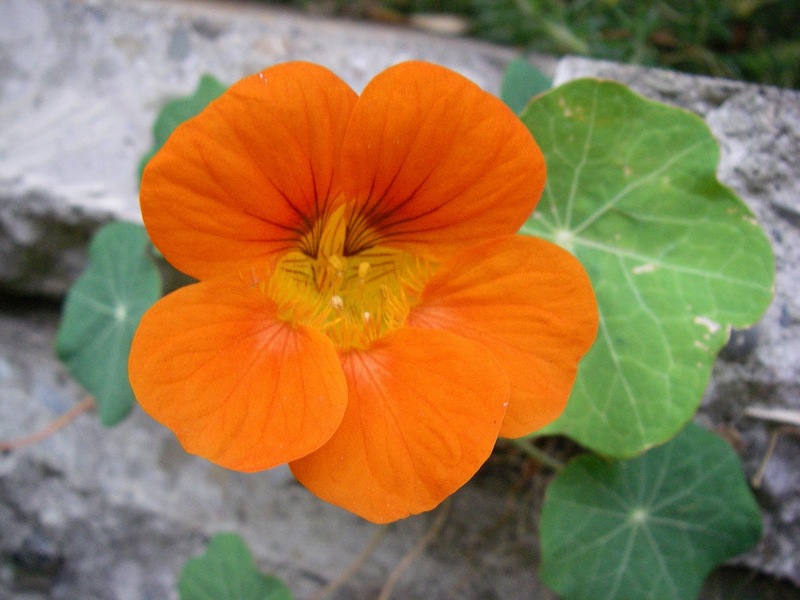 Nasturtium: this flower has a pepper scent and the colorful red, yellow and orange petals can be tossed in a salad. The whole blossoms can be stuffed with a sweet or savory mousse or the petals shredded and added to risotto or mixed with olive oil to top hot pasta. The leaves have a similar taste to watercress. Passionflower: is used as a garnish. The 10 petals are said to symbolize the Apostles present at the Crucifixion, the 3 styles represent the hammers used to drive the nails piercing Christ's hands and feet and the five anthers represent the wounds he suffered. Iceland Poppy: the red or orange petals have a slightly bitter taste, so use sparingly. Not to be confused with opium poppy (Papaver somniferum) which is illegal to grow in the US. Rose: the fruit of the rose (the hip) is a popular Vitamin C laden ingredient in many herbal teas. 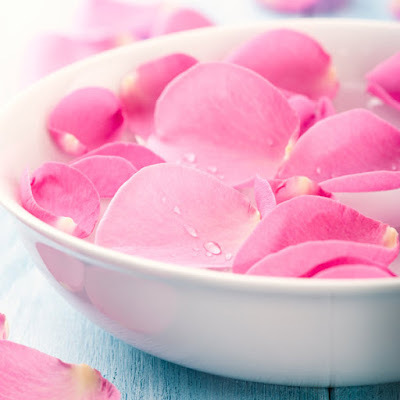 Rose water and rose syrup are used extensively in Middle Eastern and Indian pastries and confections. Rosemary: the tiny blue blossoms have a more delicate fragrance than the leaves. Use the flowers in stews, soups, sorbets and pizza. Safflower: sometimes used or sold in place of saffron in the Middle East and Mexico, it is not as aromatic or flavorful. Sage: the blossoms have a less pronounced flavor than the leaves. Do not use wild sage, which has an extremely strong taste. Society Garlic: frequently used in gardens as a border plant, its mauve starlike blossoms can be used in any dish which calls for garlic or tossed in salads. It must be kept in a well ventilated area due to the overpowering scent. This strong scent makes it ideal as a natural insect repellant. Sunflower: if left unopened, the buds can be steamed or boiled like artichokes and then tossed with a vinaigrette dressing or butter. The raw petals have a slightly bitter taste. Thyme: there are varous varieties such as lemon and pineapple. The blue flowers add a distinctive scent to soups and stews. Tulip: during WW II, much of the Dutch population survived by eating boiled tulip bulbs! The blossoms can be used as edible cups for sorbets, sweet or savory mousses or minced dried vegetables. White, peach or pink blooms look great stuffed with a chocolate mousse. Viola: has a faint, sweet taste. Great tossed in salads or frozen in ice cubes. Violet: commonly used in antiseptics and for sore throats in Victorian times. Blossoms are good in salads or use the syrup for an exotic flavored lemonade. Yucca: the heart of the stem can be boiled or steamed like asparagus and the crunchy petals eaten raw, parboiled or stir-fried. Separate the petals from the bitter center parts.